DPF400 Series are discontinued. Take advantage of close-out pricing, discounts up to 50% have been applied to all remaining inventory. As a possible substitute, please check out DPF20 for details. The DPF400 Series is a complete line of flowrate indicators offering exceptional performance at an economical price. Individual models are available for flowrate and totalization (with or without square root extraction) batch control. 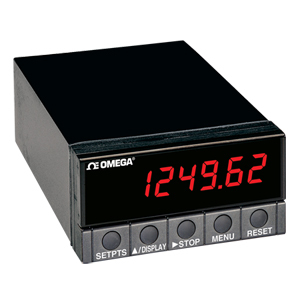 The DPF400 is front panel programmable to scale any input range to display in desired engineering units. Independent scale factors for rate and total allow rate indication and totalization in different units, such as GPM rate and total barrels. If the optional RS-232 or RS-485 communications are installed, the unit may also be programmed by remote computer. Options to the DPF400 include analog and BCD outputs, alarm/control outputs, and RS-232 or RS-485 communications. The RS-232 or RS-485 communications options are bi-directional, allowing the user to configure the DPF400 as well as read current values. While each DPF400 comes standard with 5 open collector outputs, the optional DP40-R board provides dual 7A mechanical relays which replace two of the open collector alarms, for a total of two 7A relay and three open collector alarms. Display Update: 0.04 to 3 seconds, programmable. RS-232 Communications (optional): Front panel programmable for 300/1200/2400/4800/9600/19.2k baud; RJ11 4-wire connection; complete program setup and message display capability; programmable to transmit all measured values, alarm status, actual measured input value (not scaled) and status on programmable intervals from 1 to 60,000 seconds. Analog Outputs (optional): 0 to 5 V/ 1 to 5 V/0 to 10 V/0 to 20 mA/4 to 20 mA all field selectable; all internally powered (sourcing); 600 ohms max. loop impedance for 20 mA outputs; min. 500 ohms input impedance for voltage outputs; 354 Vp isolation; 15-bit resolution; 0.1% of reading accuracy; 50 ms step response; fully adjustable zero and span adjustments.